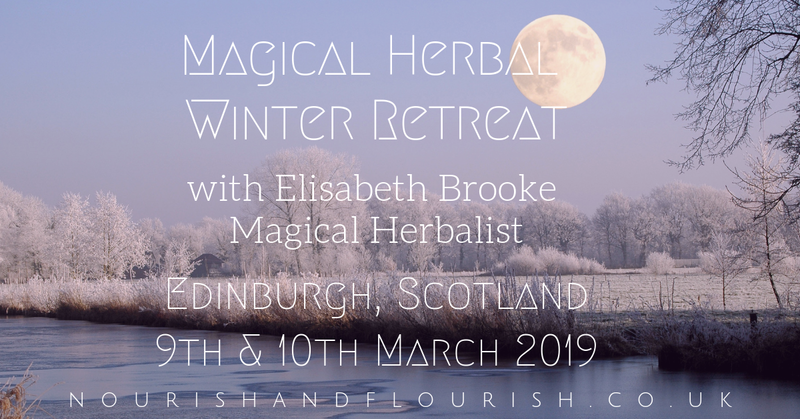 You are warmly invited to Magical Herbal Winter Retreat, an intuitive herbal retreat in Edinburgh, Scotland with Herbalist & Author of "The Woman's Book of Herbs" & forthcoming publication: "As Above, So below", Elisabeth Brooke Magical Herbalism. Working intuitively with herbs allows us to connect deeply with the character or virtue of the plant, which is often overlooked in book-learning materia medica. Herbs are more than the sum of their parts, they can be our guides as well as our teachers, if we take the trouble to get to know them as individuals. Sitting silently and tuning into individual herbs we discover their virtues and their actions on our physical, emotional and mental bodies as well as their use in ritual and ceremony. What that gives us is a profound knowledge of the character of the herb, which we have experienced personally, so we can choose the correct remedy for treatment or exploration. Experiencing a herb in this way is a never to be forgotten experience, you will always remember how they made you feel. As teachers, herbs can show us our path, help us with our shortcomings and guide us on our healing journey. Each day will be a stand alone experience while both days can be booked as a weekend immersion. We will be working with different plants each day and different ones from the previous workshops in Scotland. In this retreat we will consider the Magical Herbs of Winter - the element Water and the Phlegmatic humour. On Saturday: We will be working intensely with several phlegmatic herbs and how they affect our physical, emotional, mental and spiritual bodies. On Sunday: A more didactic day looking at the theory and practice of the element Water, the Phlematic humour and how to use it in your practice or as a tool in preventitive medicine. Elisabeth Brooke qualified as a Medical Herbalist in 1980 with the National Institute of Medical Herbalists, winning the Pharmacology prize. She ran a training clinic for herbal students at Highgate Natural Health Centre 1980-2, and was a tutor at the School of Herbal Medicine Tunbridge Wells 1979-84 in Clinical Skills, Pathology and Pharmacology. in Villa Mella and La Romana. Elisabeth has taught workshops all over the world. Recently she has given workshops in Magical Herbalism and Astrology and Herbalism at the Radical Herb Gatherings 2015/16/18. Elisabeth trained as a Psychosynthesis counsellor with Diana Whitmore and Pierro Ferucci, graduating in 1989. She now has a private practice in counselling in London, specialising in working with creative professionals, including students from RADA. She studied and worked with Maggie Hyde and Geoffrey Cornelius of the Company of Astrologers from 1980-1989. She tutored in Medical Astrology, Tarot and Numerology for the Company and produced articles for their Magazine. Elisabeth will be offering her third retreat as a guest teacher for Nourish and Flourish with Fiona Morris, facilitator for nature wisdom inspired retreats and workshops. Dates may be booked separately or together, subject to availability. Local accommodation is booked separately. Visit www.Booking.com or www.airbnb.co.uk for accommodation options. Please bring a pot luck contribution for a shared lunch, or bring your own for special eating requirements. Tea & coffee breaks provided on both days. Please let us know as soon as possible if you need to cancel so that we may be able to offer your space to anyone on the cancellation list. NB: Refunds given up to 30 days prior to event (less 10% for admin costs). After that no refunds given, but value may be carried over to the next workshop or used as a consultation credit with Elisabeth or Fiona. You may transfer your place to another participant, if you can find someone to take your place.